I wanted to add a few quick thoughts on the nature of "stipulative definition". 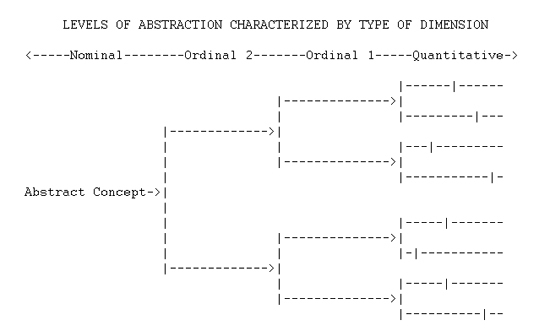 The way I see it, by understanding semantics and definition in terms of intention -- "stipulated definition" -- we can clear away much of the confusion associated with attempts to ground definition in social convention. Most of the concepts we use are defined at a high level of abstraction, with a somewhat blurry mapping from that level of abstraction to anything specific or concrete "in the real world". That blur or potential confusion emerges because social convention is at best a statistical thing, something like a "cluster", with an approximate range of meanings (perhaps a little bit like the graphic we are using for this discussion). This is a "stipulated definition" -- as it might be defined by some lender. This isn't an attempt to define credit-worthiness in all cases or situations -- but in a specific case, as defined by some lender or person with an interest in this particular concept. This diagram shows a "cut" at the bottom level of each defined dimension -- much as if that bottom level were a linear dimension of measurement, and the "cut" defined a bounded range (in a digital space, numbers are always defined to some finite number of decimal places -- and "the next decimal place", undefined, is always a kind of mystery -- an uncertainty knowable only within bounds). 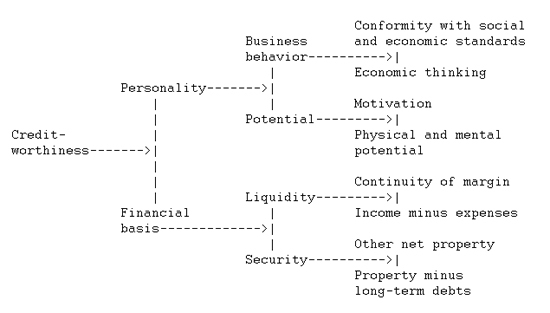 To generalize this concept to all instances of stipulative definition, we can simply say that "words" (like "credit-worthiness") are usually defined at some level of abstraction, with some kind of potential decomposition tree extending towards lower levels of analysis (higher degrees of specificity). This decomposition is always "implicit" -- it's not explicitly defined or stated, until for some reason we are motivated to make the decomposition exact and explicit and particular. Towards this end, we can propose an approximate ordering of the categories and disciplines of human knowledge, ranging along this distribution -- high-level inclusive abstractions on the left side (of these diagrams), and empirical specifics and "measurables" on the right side. And we need not offer this model in some rigid format. It, too, even though offered as a general principle, is "local and ad hoc" and specific to some particular moment. It's the general form that is invariant. The specifics are 100% context-dependent. And this is not a new idea. The ranking or ordering of variables in this way is a common thing in the social sciences. What may be new is the generalization of this idea to all cases of stipulative definition. It is true that any act of communication depends on these abstractions being "more or less understood" by the listening party. Talking to a banker, he may simply speak about credit-worthiness as a broad generalization, without offering specifics. But when the time comes to take out the loan, the numbers will become specific. In the end, the entire assembly adds up to a binary option: yes or no. And where did the specifics come from? They are assigned to this matrix by the bank or the banker, according to their policy. They intend, they stipulate, they create the definition. And, indeed -- they may make the "empirical measurements" that determine the overall yes or no determination.